The heaviest rains continued to stay to our east and west, but unlike Monday, Tuesday brought rain to the greater Houston area. The Beaumont area received another 6 to 9 inches of rain bringing their totals since Monday to around 15 inches. 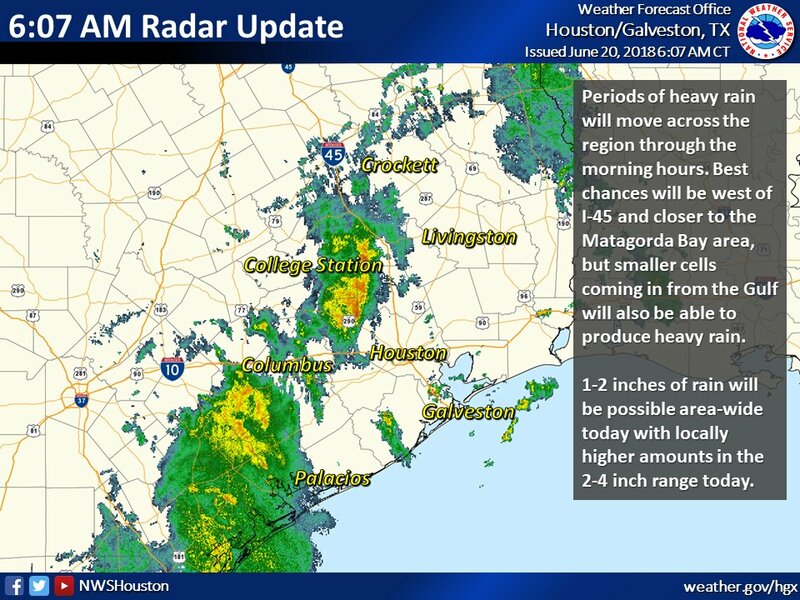 In the Houston area, Tuesday’s rain primarily hit on the western portions of the region including Waller and Fort Bend County. Some of yesterday’s totals were between 2 to 4 inches with peak intensities between 2 to 4 inches per hour. Today could be similar to yesterday. The NWS is forecasting that much of our region could see between 1 to 2 inches with heavier bands producing intensities of 2 to 3 inches per hour. Isolated areas could see higher totals between 2 to 4 inches. With these intensities our biggest threat is from flash flooding and/or ponding in roadways. So far this morning, we have seen storms roll through that have dropped as much as 4 inches in the past 6 hours. The majority of that rain (1 to 3 inches) has been in the west and north portions of Fort Bend in the Brazos River, Bessies Creek and Buffalo Bayou watersheds. This type of activity could continue throughout the day. The good news is that the activity should start to decrease overnight and through tomorrow. The weekend forecast is calling for low rain chances with sunny to partly sunny skies. Yesterday we started to see the Brazos River rise in San Felipe, Richmond, and Rosharon from the rain that occurred downstream of Hempstead. 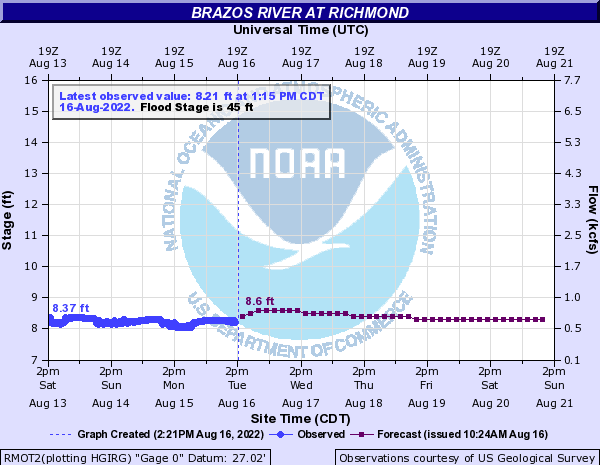 We could continue to see the river rise from the additional rainfall received today; however, we do not anticipate a flood event along the Brazos River to occur. Due to the rainfall, the West Gulf River Forecast Center has issued forecasts for the San Bernard River, but as of this email, there have been no river forecasts published for any of the flood forecast points along the Brazos River. An end to the rain with sun on the way.